I’m not sure there is another cooking application that matches the ease and creative fun that poaching fruit offers. In essence, it’s like coloring with flavor… a simple pot of sweetened liquid infused with bits and bobs of spice and… voilá… you have a naturally delicious fruit dressed up just a bit. While you poach eggs, and poultry, and various other edibles, I think pears are probably the most elevated in the hierarchy of elegance when it comes to this technique. Perhaps it’s their amenable nature when at the height of their season... perfectly ripe, naturally sweet and deliciously mellowed to the touch... a mellowed appeal that generously welcomes the addition of flavor. Or, perhaps it is their graceful shape that elevates their appeal. Whatever the rationale, poaching simply enhances the natural, sun-ripened nectar of this fruit. And, it’s as easy as boiling water... and selecting the right pears! 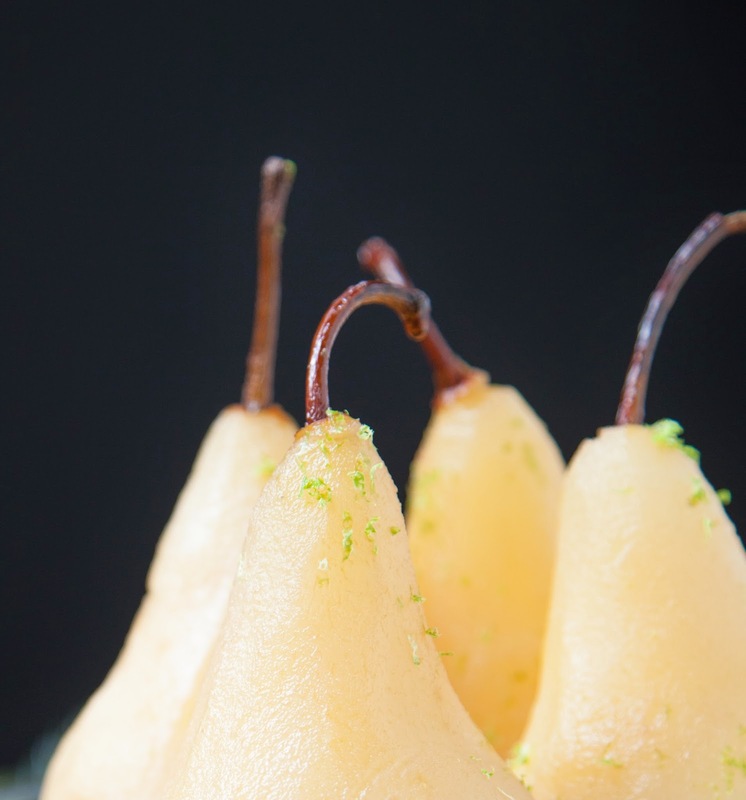 A firm, ripe pear is critical to achieving a beautiful poached pear and Stemilt’s d’Anjou or Bosc varieties are particularly perfect choices. I am, however, partial to Stemilt’s Bosc pear simply for its elegant, elongated shape and delicate stems. Either of these varieties, however, have a wonderful, firm flesh that will stand up well to poaching. Beyond selecting the right pear variety, poaching requires only two things: determining what liquid you’ll poach in, and how you want to spice up that liquid. Using Stemilt’s Bosc pears, I started with a bottled, organic Cranberry Nectar that I enhanced with some flavors of the season... cinnamon, star anise, fresh orange and for a little pop... pink peppercorns! The result is a mildly sweet poached pear (you really don’t have to do much to a beautifully ripened Stemilt pear!) with just a hint of holiday flavor. And, to celebrate the season, propped atop a bed of fresh pomegranate seeds and sprinkled with a little lime zest. 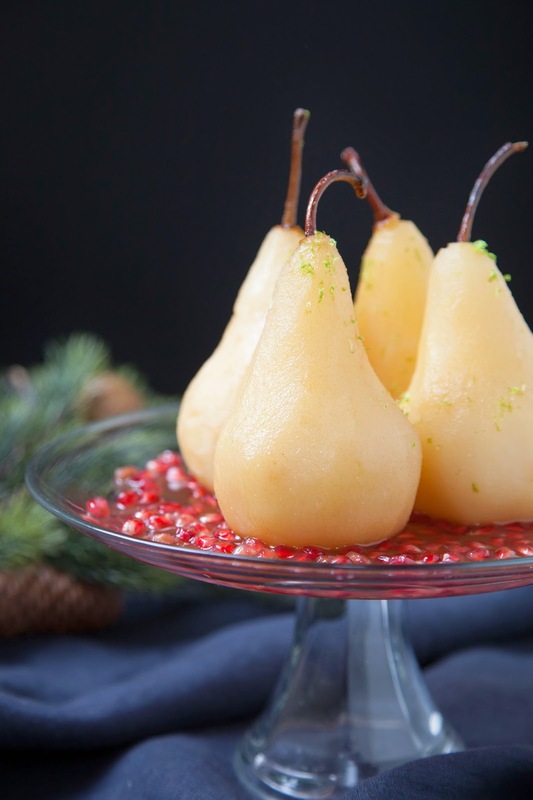 For recipe details, and a general how-to on poaching pears, visit Stemilt’s blog, The Stem. Disclaimer: While I have been compensated by Stemilt Growers for this recipe development project, including photography, the opinions expressed on A Savory Nest are my own. Recipes and all images are the sole property of Stemilt Growers.